We offer a variety of tent styles and sizes. You can feel confident your tent will look beautiful. We take great pride in making sure our tents are clean and white. We believe in detailed planning, polished execution, and a high quality, well-maintained inventory. Our small pole tents are perfect for many occasions: picnics, graduations, showers, family reunions, anniversaries and birthdays to name a few. We have sidewalls uniquely suited to match each of our tents. Interested in heating or air conditioning your tent? Our High Peak Frame Tents have a sleek, modern design and come in various sizes and configurations to suit your needs. We have lighting uniquely configured for each of our tents. Installation is always included. Unsure what size tent you need? Start with our handy seating chart. Our large pole tents make for an impressive event. Their elegant style is perfect for weddings, corporate or church events, and large gatherings. 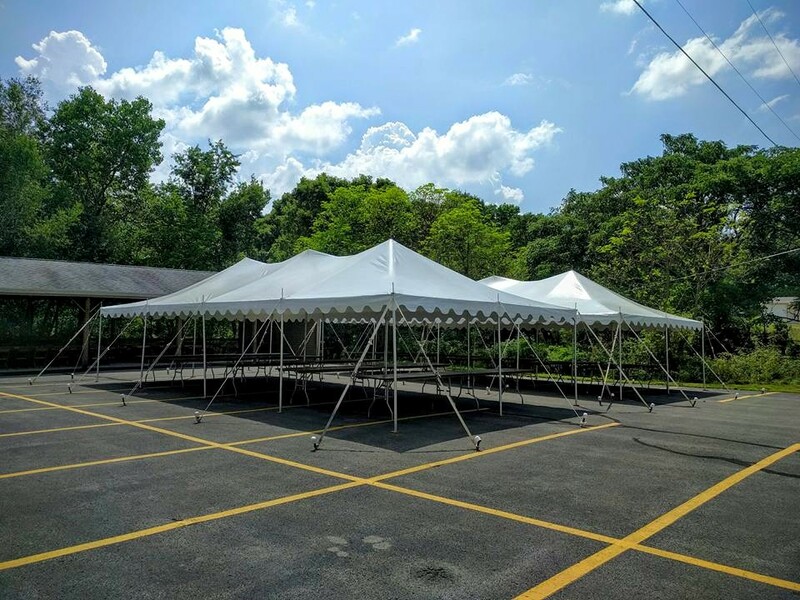 Our tents can be secured in asphalt upon a customer's request.